1. Preheat oven to 300 degrees. Lightly spray a cookie sheet with canola oil (or rub some on with a paper towel or pastry brush). Spread pumpkin seeds evenly over sheet. Roast for 15 minutes or until almost dry. 2. 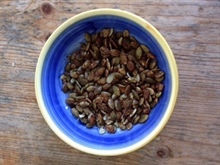 Place in seeds in bowl and mix with maple syrup until coated. 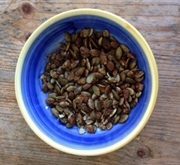 In a separate small bowl, combine spices and salt and then sprinkle over the pumpkin seed/maple syrup mixture. Place back on cookie sheet and return to oven. Bake an additional 15 minutes until dry, watching towards the end of the cooking time to make sure they don’t burn.